Understanding the Technology Behind Synthetic Insulation in Jackets 0 84 Views 0 0 SHARES Share On Facebook Tweet It print Fur. Goose down. Wool. There are lots of natural materials used to help keep us warm. But when it comes to insulation that can handle the types of days that start before the sun comes up and end after it goes down, you need something that can’t be found in nature. Synthetic insulation is lighter, tougher and warmer than natural options. All insulation works the same way – it creates air pockets that trap heat next to your body. It also prevent cold air from getting through the barrier to your skin. Synthetic insulation in jackets is made of tiny fibers that are great at forming tiny pockets for trapping air. Not only is it just as good as down at providing warmth, it lasts longer – through tough days, long nights and more washes. The many talented engineers and scientists who developed synthetic insulation designed it to address a couple of the key shortcomings of down. Chief among those is that, as great as down can be, it becomes dramatically less effective when it gets wet. Synthetic insulation also has a couple of other advantages over down—namely, that it’s more cost-effective as well as being naturally hypoallergenic. Water-resistant coatings on the jacket shell or on the down itself can help, but synthetic insulation is still the gold standard for moisture-resistant insulation technology. So what does this all mean? If you think you’ll be encountering wet weather or working in an environment with lots of precipitation, synthetic insulation technology is your best friend. 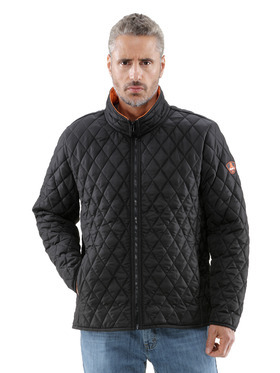 Lightweight Diamond Quilted Jacket: This light and ultra-comfortable jacket provides great protection at above-freezing temperatures. It offers 180g insulation and bound seams for improved draft resistance. With its slim, flattering profile and orange accents, it’s also a stylish look that’s not just for work. RefrigiWear Softshell Jacket: When you need industrial-grade durability without sacrificing mobility, this softshell jacket delivers. It’s seriously warm, with 300g insulating power, and it features an ultra-light, ultra-tough outer shell. A zip-up collar and drawcord hem create a protective seal for your body against the cold. Iron-Tuff Siberian: As you can probably guess from the name, this isn’t a windbreaker. The Siberian is one of our most rugged models—perfect for when you need the toughest and warmest protection in the harshest conditions. A soft fleece collar adds the perfect touch of comfort. RefrigiWear Extreme Softshell Jacket: The Extreme Softshell Jacket is the warmest jacket out there. Rated to -60°F – no, that’s not a joke – it features dual-zipper climate control and all the little extras you need for ultimate comfort. The result? A jacket that will let you make Mother Nature say uncle. When it comes to insulation, synthetic doesn’t mean “knock-off.” It means protection engineered to provide warmth that can stand up to the wear and tear of your days.